FOGS JUNE 2004 solstice newsletter started the alert for all this wobble-watching. Now, two months after the wobble — lunar maximum occurred Sunday, June 11, 2006 when the moon reached its major standstill — we on the 57th degree parallel are experiencing withdrawal from our companion in orbit. Orkney, Shetland and Lapland watchers are even more deprived, as the earth’s satellite barely shows her face at full above the southern horizon. This, its wildest fluctuation in the 18.6-year Metonic cycle, will continue into the autumn months. However by winter solstice we shall once again have a companion in full visibility in the night skies. Think of it this way: in the darkest days of December, the sun at our latitude rises in the south-east and sets in the south-south-west, barely grazing the tops of some of our frostly hills. This summer, the full moon has been doing just that: rising qnd setting (on full moon night and a couple of nights on either side) in roughly those same compass points, reflecting in amazing precision the path of our solar partner. That is a simplification. It means if we aren’t looking in the right place, chances are we’ll miss it. It is more precise to say that on October 22, 2005, the moon was closest to full (71%) while standing at its most northerly position in our skies for 18.6 years. By definition, quarter moons stand at the most northerly point in the sky. For an exact calculation, check Victor Reijs and our FOGS moon standstill posting, immediately below. There is a discussion group at Archaeocosmology. Many archaeoastronomers believe that some cupmarks on NE Scots recumbent stone circles mark the maximum moonset for this cycle. If so, then the circle-builders’ technology predated Meton (432BC) by some 3000 years. Those of us planning to attend FOGS’ 2006 AGM at Cothiemuir on September 16th will be able to check for ourselves as the large recumbent there displqys a cluster of cupmarks on its face with a view angled farthest to the SSW — the most extreme viewing position possible from within the circle. Cothiemuir, NJ617 198, is accessed from My Lord’s Throat, and is one of the earliest of the NE’s RSCs. Contemporary neighboring Old Keig has the largest recorded recumbent stone, weighing in at 53 tons. The glass was inscribed with the names of antiqurian Charles Elphinstone Dalrymple, his two colleagues and the local farmer of Broomend, with the date of their excavation, November 22, 1855. Victorian antiquarians frequently left small tokens for their successors to find. Dalrymple’s family owned Logie, near Pitcaple; sometimes called Logie-Elphinstone. The Port Elphinstone excavation was one of his favourites and showed most detail: including the avenue of 72 megaliths stretching between Crichie and Tavelty, Kintore. Only two of these avenue stones remain. Lloyd Laing, Simon Taylor, David Dumville, Gordon Noble, Nicolas Evans, Strat Halliday, Andrew Heald and Mike King. 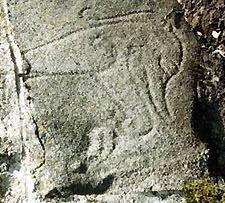 It is refreshing to see work continuing in the NE where Pictish fragments continue to be found, viz. 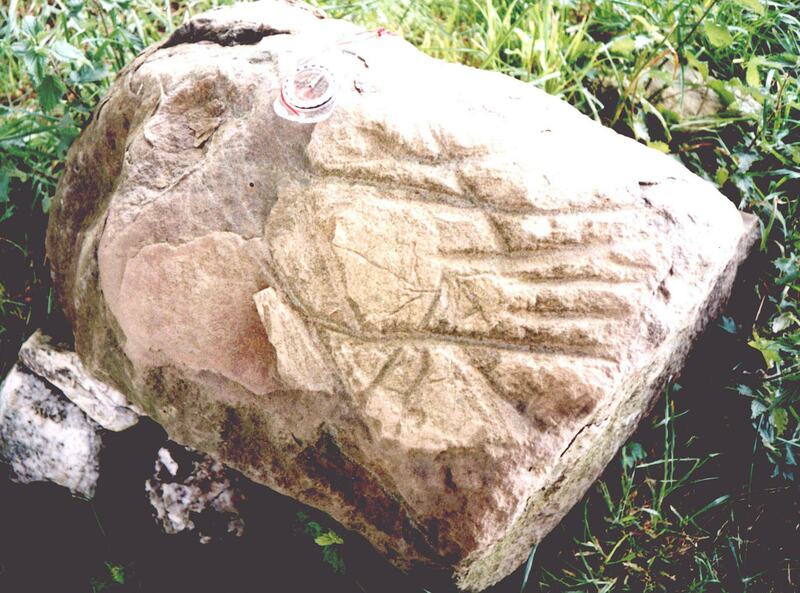 Forgue eagle-stone, left (DES 1999:9) and a ‘creature’ found in a garden wall at Rothiemay (DES 2002:11). More information available from the Institute, Kings College, University of Aberdeen. DES = Discovery and Excavation Scotland, whose online documentation of earlier DES publications has reached 2008. Rosslyn Chapel, south of Edinburgh, has traditionally attracted the specialist visitor interested in its alleged connection with the Knights Templar and the Holy Grail. Following the release of Dan Brown’s ‘daVinci Code’, visitor numbers have tripled. Rosslyn's 15thC barrel-vaulted ceiling divided into five compartments. The crypt has Templar carvings. 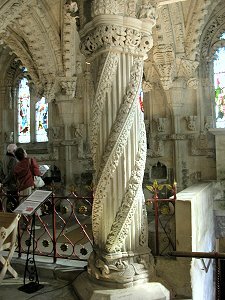 The Rosslyn Chapel Trust chose a timely moment to make a record of what is probably a unique example of late-Medieval ecclesiastical architecture of the pre-Reformation period. The chapel was begun in 1446 at around the same time as work started on Glasgow Cathedral. It is one of the few remaining intact pre-Reformation chapels left in Scotland. It towers over the edge of Rosslyn Glen, whose layers of sand, gravel and clay have posed subsidence problems in the past. One exit from the crypt opens on to a gravel bed. AOC Archaeology Scotland have been employed to create a laser scan record of both interior and exterior; they hope to avoid pitfalls encountered in photography, where a substantial exterior scaffolding canopy –needed for the work– masked several unique features. Scanning has resulted in remarkable three-dimensional and 2D images of the building and its extravagant architectural idiom. This includes the lavishly-decorated interior with its now-famous ‘apprentice pillar’. It is the first full high-precision record to be made on the site and will prove invaluable for research, conservation and for future generations to refer to as a baseline for the building as it now stands. It is hoped many of the scanned images will be made available on the web. Our readers will forgive us if we take time in this issue, time out from our personal and prehistoric preoccupations, to pay respect and show our admiration for a fellow stone-lover, nay, fellow earth-lover, and supporter of our cause — to raise awareness to our unique environment — the ancient landscape of NE Scotland. It is with sadness that we say farewell to Ann Tweedy Savage, stones-supporter, tree-planter, philanthropist and naturalist who died prematurely in a fall in January 2005. For over 30 years, she contributed both personally and financially to restoring the natural environment, community and fen shui (‘sense of place’) of Bennachie, on whose northeastern shoulder she lived, and where (Harthill) she is now buried. In addition to her support of many local projects and enterprises, she chose to give generously to FOGS through the Brownington Foundation, and for those past annual donations — sometimes when we were in most need — we will always be grateful to her. We know of at least one other archaeological charity, the Scottish Episcopal Palaces Project at Fetternear, which also benefited from her generosity. Her lively interest in her surroundings and enthusiasm for restoring the landscape she so loved will not long be forgotten. One place closest to her heart was Bennachie, a lone mountain sentinel in an otherwise flat, fertile plain. One of its honorary Baillies, she refused to give up when commercial interests threatened (and still threaten) to invade this mountain wilderness. She saw Bennachie, as do many of us, as an ancient, sacred place, and, at night, almost the last bastion of darkness (and therefore wildness) in what has become a sea of light in the Garioch. It was her wish that this wild habitat should not be threatened; should be allowed to return to its natural state. She felt its trees, heather and scrub should be supported to maintain their own unique environment, species of plants and animals, until the human race becomes wise enough to give it the respect it deserves. There are qualities our friend embodied — amid joy and laughter — which allowed her to accomplish so much in a short life: if some of us were to emulate, we might similarly achieve great things: they are — in no particular order: generosity and the avoidance of waste, love-of-life, perseverance and determination. Thank you, Ann, you are sorely missed. Solstice marks the apparent standstill of the sun twice annually. After disappearing into the shortest night, a sight that Northeast FOGS from our elevated latitude can claim a special privilege, sunsets wend their way southward along the horizon. Six months later sunset reaches 223º, SSW — a legendary point on the compass captured within the earliest recumbent stone circles. Motion of the moon too, apparently wild, nevertheless has a cycle, calculated by Meton (432BC), returning to the same place once in 18.6 years, or after 235 lunations. Major lunar standstill occurs on that occasion when the full moon closest to midsummer only barely rises above the S horizon, grazes it and sets, all within an arc of just over 45º. A non-event, you might think; yet at the Arctic circle, the summer full moon does not appear at all. So it is notable that early (largest) RSCs are often cupmarked, clustering on a stone in the SSW arc where the lunar standstill could be witnessed: Balquhain’s W flanker & the recumbents of Sunhoney, Cothiemuir and Rothiemay have cupmarks oriented SSW: 232, 230, 200 & 226 degrees respectively. At Cothiemuir, NJ617 198, in 2006 maximum summer full moon will seem to set right into the recumbent’s western edge. 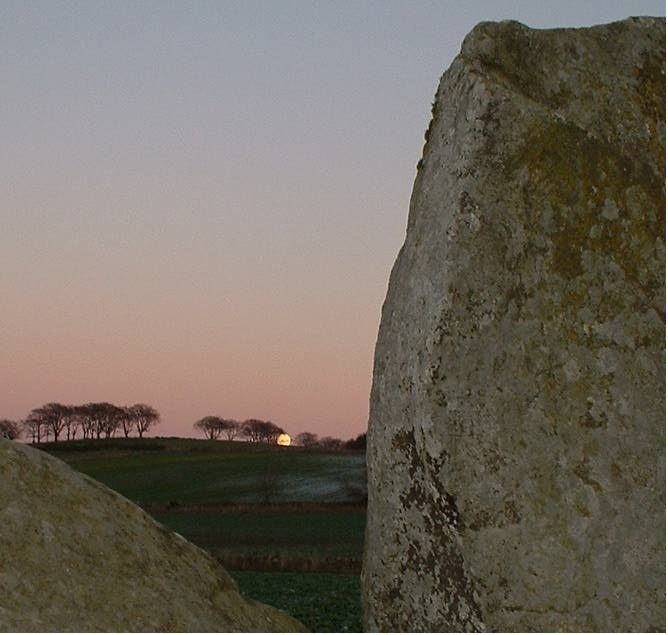 Full moonrise closest to winter solstice, from the stone circle at Kirkton of Bourtie. Midwinter standstill moon acts like a 'midnight sun', barely setting in 24 hours. Also in a major standstill year, the full moon closest to midwinter performs an incredible feat, swinging higher in the sky from a rising point farther N than any other in its 18.6-year cycle and setting farther N than at any other time: the full moon seen at Aberdeen/Moray latitude, 57º30′, behaves almost like the lunar equivalent of a ‘midnight sun’, rising and setting in the North, (at 27ºNNE and 333ºNNW to be precise)and spending the longest time in the sky of any appearance in its metonic cycle. In astronomical circles (and prehistoric ones) excitement is already building towards the major lunar standstill which peaks in 2006, when full summer moonrise and set reach their farthest possible southern limit and briefest appearance: at Easter Aquhorthies, NJ733 208, the full summer moon will rise at 151ºSSE and set at 208ºSSW, and, while there are no cupmarks at this RSC to show its ‘maximum’, it should be spectacular. Equally, in the run-up to this maximum, the full winter moon can be seen from as early as November 2005 to show a huge ‘wobble’, rising and setting farther North than at any other time, swinging highest and longest in the winter night sky. FOGS inspired by lunar antics may be daunted by the profusion of information on the Web at sites such as http://www.iol.ie run by Victor Reijs who is encouraging world-wide moon-watching and gives azimuth, declination and degree at several sites with breathtaking accuracy. ‘I think Victor is trying to measure astronomical variables to an eye-watering degree… However, if you simply extend your arm fully in front of you, with the thumb upright, the width of your thumbnail is approximately one degree. The fourth decimal place is 1/10,000. See Hawkins: Stonehenge Decoded, 1965. *HISTORIC SCOTLAND has traditionally chosen which monuments it deems ‘suitable’ for protection (‘scheduling’). If it does not choose to schedule a monument, no responsibility is taken by this Scots state agency to protect such monuments, should any damage or disruption to such sites occur. In 2006 HS even suggested it was considering ‘delisting’ some sites. Thankfully none of these is in the Aberdeenshire area. FOGS, however, believes this is an unacceptable state of affairs in the 21st century and is doing everything in its power to change the bureaucratic view. The following list compiled by FOGS was received by Historic Scotland, but HS would not confirm whether any or all would ever receive protective ‘scheduling’. NJ 738 083 Old Wester Echt (HS calls New Wester Echt) recumbent stone circe 170, SW of farmhouse New W.E. Much speculation surrounded the recent transit of Venus across the face of the sun: whether prehistoric Man was able to detect such an occurrence with no technology to help him. Reversed telescopes, bits of paper, special sunglasses were used as evidence of our advanced state of awareness of this 120-year happening, a six-hour crossing of the sun’s disc by Venus in retrograde motion. Esoterically, Venus aligns with Isis, Aphrodite and lesser-known ancient love goddesses like Babylonian ’Athtar/Ishtar. Her crossing before the sun-throne was believed to enhance or magnify through her ‘lens’ blessings of love flooding on to the earth. Without telescopic aid, classical astronomers were consummate calculators and the orbit and cycles of Venus were as familiar to them as those of the moon. But they had another advantage which we now appear to lack: an intuitive knowledge of cosmic influences, much of which has deteriorated into brief mythical allusion or into the much-maligned art of astrology. By dismissing all but the rational, our society may be guilty of throwing the galactic baby out with the bathwater of the cosmos. It is known, for instance, that transits of Venus affect the earth’s magnetic field by blocking electrically-charged particles of solar wind which can cause ‘anomalies’: between June 4-9, 2004, with the aid of a full moon, terrestrial tides were the lowest for 19 years. Such celestial influences would not have gone unnoticed by our ancestors, as they are by us. As a prelude to a transit, Venus’s disappearance from both evening and morning sky would also be seen as remarkable. Transits occur in pairs. Each is separated by a period of eight years as Venus passes, as it were, pillars of a gateway first retrograde and then direct; not to be repeated for at least a century. Transits of June 1761/ 1769 and December 1874/1882 are modern compared with those calibrated in the Mayan Long Count of cycles which have elapsed since their zero date of 3113 B.C. The Mayas’ reputation as astronomers is unsurpassed: one of three hieroglyphic texts to survive Spanish book-burning is the so-called Dresden Codex containing precise astronomical calculation of Venus’s synodic period along with (solar) eclipse prediction tables of great accuracy. It is to the Maya we owe a debt of gratitude for a reminder – if we are paying attention – that in 8 years time, in June 2012, in their calendar, Venus returns through her gateway and marks the end of Time. Solstice marks the apparent standstill of the sun twice annually. In June, after disappearing into the shortest night, a sight that Northeast FOGS from our elevated latitude can claim a special privilege, sunsets wend their way southward along the horizon. Six months later midwinter sunset reaches 223º, or SSW, a legendary point on the compass captured within the earliest recumbent stone circles (RSCs). Motion of the moon, too, apparently wild and chaotic, nevertheless has a cycle. This was calculated by Meton in 432 BC, as returning to the same place once in 18.6 years, or after 235 lunations. Major lunar standstill occurs on that occasion when the full moon closest to midsummer only barely rises above the southern horizon, grazes it, and sets, all within an arc of just over 45º. A non-event, you might think. Yet at the latitude of the Arctic circle, the summer full moon does not appear at all. So it is notable that early (and indeed, largest) RSCs are often cupmarked, with special clustering appearing on a circle stone in the SSW arc where the lunar standstill could be witnessed. At Balquhain in the Garioch the West flanker is heavily cupmarked. This is also true of the massive recumbents at Aberdeenshire’s Sunhoney, Cothiemuir and Rothiemay stone circles: all have cupmarks oriented SSW: at 232º, 230º, 200º and 226 degrees respectively. At Cothiemuir, at Keig near Alford NJ617 198, in 2006 maximum summer full moon will seem to set right into the recumbent’s western edge. Also in a major standstill year, the full moon closest to midwinter performs an incredible feat, swinging higher in the sky from a rising point farther North than any other in its 18.6-year cycle. It also sets farther North than at any other time: it is as if the full moon at this time is the dominant orb of the whole sky. Ancestral wonder would have been piqued to see this planetary body in almost full possession of the night, rising in the north, circling the celestial pole and setting again in the north. The full moon seen at Aberdeen/Moray latitude, 57º30′, behaves almost like the lunar equivalent of a ‘midnight sun’, rising and setting in the North, (at 27ºNNE and 333ºNNW exactly) and spending the longest time in the sky of any appearance in its metonic cycle. In astronomical circles (and it would have been so in prehistoric times) excitement is already building towards the major lunar standstill which peaks in 2006, when full summer moonrise and set reach their farthest possible southern limit and briefest appearance. At Easter Aquhorthies, near Inverurie in the Garioch at NJ733 208, the full summer moon will rise at 151ºSSE and set at 208ºSSW and while there are no cupmarks at this RSC to show its ‘maximum’, it should be spectacular to see it graze the horizon. Easter Aquhorthies is sited in such a way that its view of the south is marginal in any event. This brief appearance of the summer moon would have set prehistoric hearts aflutter. Equally, in the run-up to this maximum, the full winter moon can be seen from as early as November 2005 to show a huge ‘wobble’, rising and setting farther North than at any other time swinging highest and longest in the winter night sky. When Romanized Greek astronomer Claudius Ptolemy wrote his mathematical compilation of the heavens in Alexandria in AD150 from a geocentric perspective, it was the Great Compilation. Seven hundred years later when it was translated into Arabic c.AD827, it became ‘the Greatest’ – Al-Majisti. It remained so until Copernicus in 1543 challenged our attitude to geocentricity, although we earthlings still look heavenward with earth-bound eyes. For devoted planet-watchers or to find current moon and planet phases, Almagest in clock mode gives a 3-D view of those orbs as seen presently on earth.In reference mode its hand-crafted brass gears can show planetary positions against a background of stars (the horizon plate) at any time or place between 1000BC and AD5000. For photographs and more detail on this British crafted timepiece, see his website. FOGS inspired by lunar antics may be daunted by the profusion of information on the Web at sites such as that run by Victor Reijs who is encouraging world-wide moon-watching. His website is lovingly maintained and gives azimuth, declination and degree at several stone circle sites with breathtaking accuracy. See Gerald Hawkins 1965 Stonehenge Decoded, John Edwin Wood 1978 Sun, Moon and Standing Stones, Knight/Lomax 1999 Uriel’s Machine’. FOGS’ website features Knight/Lomax who built such a machine based on instructions in the Bible’s Book of Enoch. 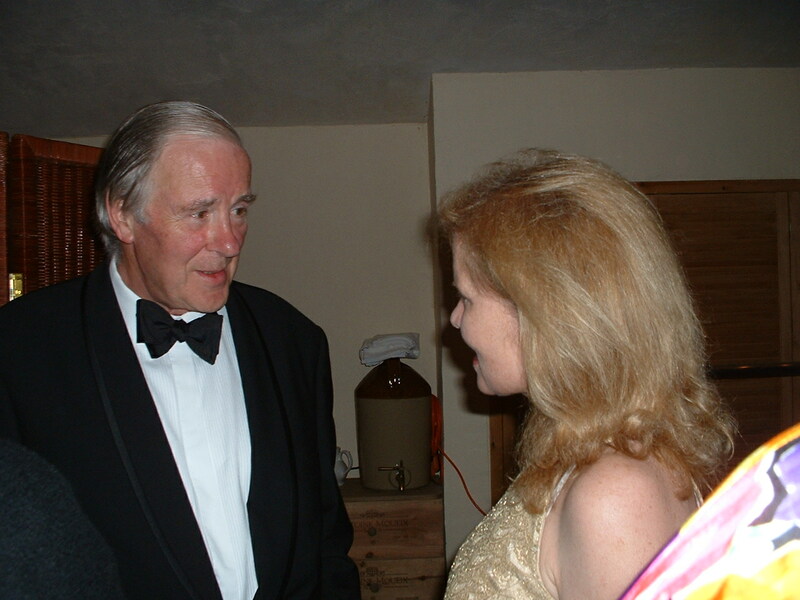 Editor’s note, 2009: after the death of Gerald Hawkins in 2003, it is sad to see National Geographic’s manipulation of his ideas into a full-length two-hour video called ‘Stonehenge Decoded’, narrated by Donald Sutherland. It is hoped that the Hawkins family is adequately compensated for the use, not only of his title but his original idea. PRIVATE is a politically-incorrect word these days. It is almost as if ‘public’ is the only recognizable form of sponsorship, activity, opinion, custodianship or, dare one suggest, even ownership. Private people, however, have for several generations borne the burden of expense and maintenance of our Northeast antiquities and, without fanfare, continue to do so. 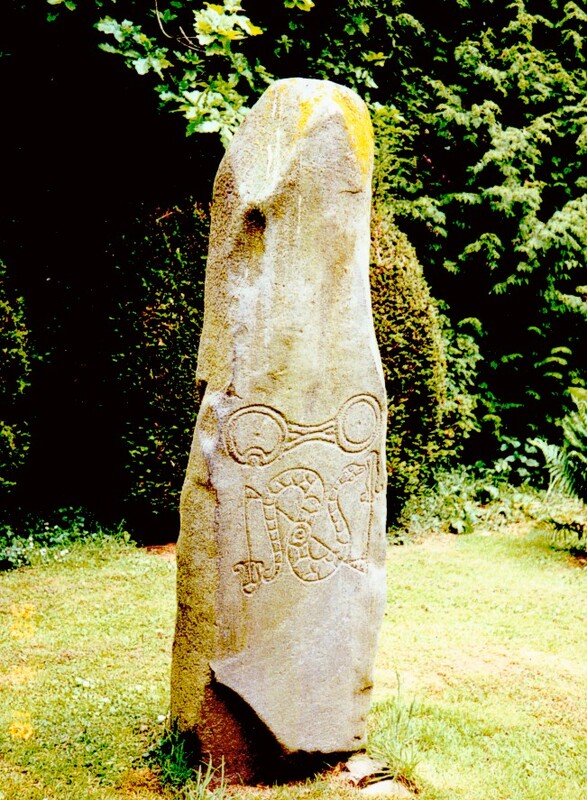 Next summer, 2004, the National Trust for Scotland will celebrate the 50th anniversary of its being given the estate and house of Leith Hall, Kennethmont, home to two Pictish carved stones: the Tod Steen (‘Wolf Stone’) from Newbiggin-Leslie and the Percylieu salmon-horseshoe stone, originally from the Salmon Well, Tofthills-Clatt. NTS proudly proclaims its custodianship of antiquities on its properties, doing a remarkable job of continuity – reorganized under specialists in respective areas (archaeologist for antiquities; surveyor for properties; education specialist for information dissemination). Newton House in the Garioch has recently changed hands, but descendants of the Gordons of Newton have for over a century maintained and protected two famous Pictish carved stones found on the estate – open to view by appointment with the new owners. 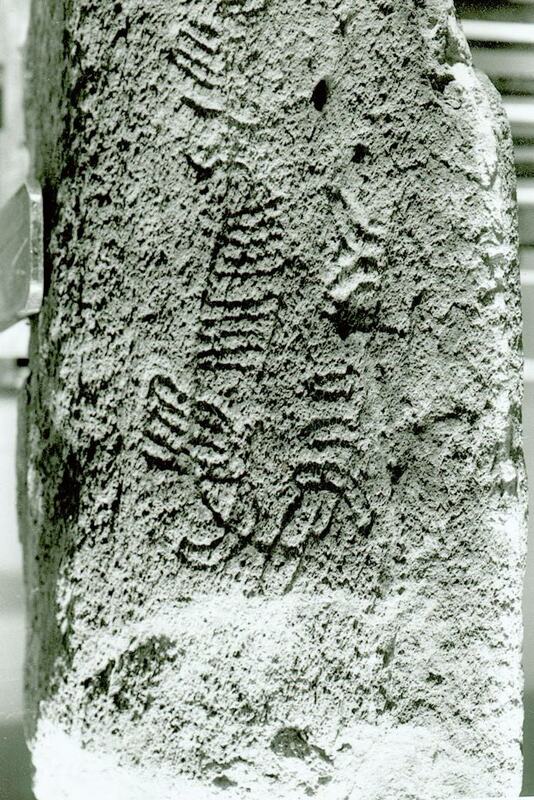 The Newton ‘serpent’ originally stood on the march between lands of Rothney and Newton on the Shevock and the ogham pillar (plus ‘unknown script’), sometimes called the Pitmachie stone, stood at the tollgate of Shevock near the farm of Pitmachie. The proprietors of Whitestones House, Rothiemay continue to maintain invaluable records of the carved stones in their care, the few remaining (unscheduled) Tillytarmont-Rothiemay stones to stand within their original precinct – the rest are in Marischal Museum, Aberdeen. Thanks to the proprietor of Tillypronie, Tarland, the ancient Christian site on which the pre-Reformation church of Migvie was built and to which Migvie antiquities gravitated, has been lovingly restored, reclaiming a ‘lost’ stone kept at Aberdeen, re-siting the revered Tom-a-Char and highlighting the marvellous Migvie cross-slab whose images are arguably the most primitive in Pictish iconography. The list goes on: the recumbent stone circle of Tomnaverie, Tarland could not have been restored and its disintegrating quarry walls shored up without funding from the MacRobert Trust. 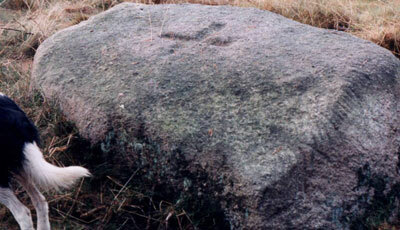 Antiquities on the Avochie estate – including a 5000-year old cupmarked boulder of huge proportions and Pictish cross-stone, both unscheduled – are in the care of the Avochie laird. RSCs of Ardlair, Balquhain, Dunnydeer, Easter Aquhorthies, Nether Wheedlemont, Sunhoney, and the Candle Hills of Ardoyne, Rayne and Insch are all dependent on their local landowner for protection from ploughing and for the obligement of maintaining a ‘public’ access path as they receive no payment, grant or gratuity from the state. Locals in Stuartfield still pay their respects to the White Cow quartz pillar, one of several avenue markers connecting RSCs on the Crichie estate whose laird is a keen regeneration tree-planter and stones conservationist. Continuity on Forbes lands is without question – the Forbes line stretching back unbroken to O’ Connad Cerr mentioned in the Irish Annals in AD693. 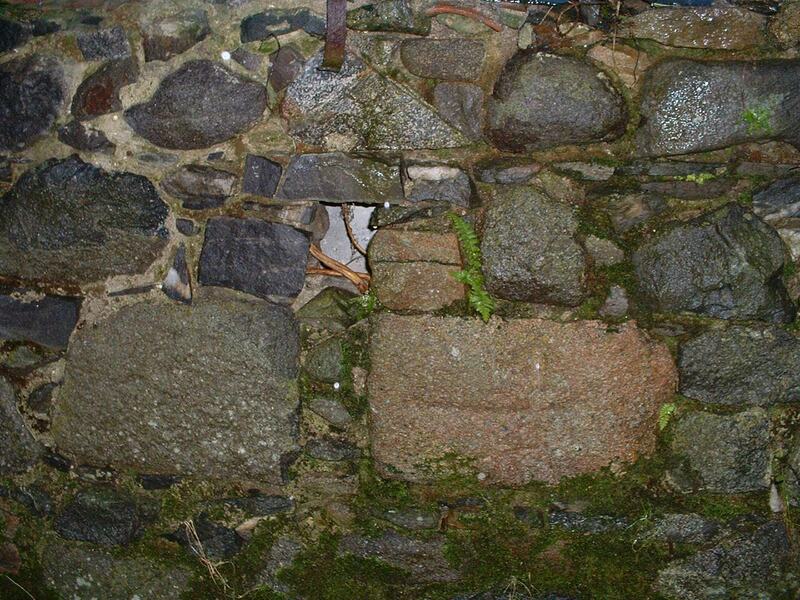 Antiquities in Forbes’ care include the venerable RSCs of Old Keig, Cothiemuir and Druidstone on the Brindy, along with a myriad other antiquities previously unrecorded until the present RCAHMS survey of Aberdeenshire. FOGS have always valued the contribution made by landowners and shown our gratitude at appropriate times; many of our AGMs, after all, have been made possible by kindly lairds. With the ever-increasing influx of city-dwellers who now wish to live ‘in the countryside’, perhaps we are being called to show by example appreciation for the debt we owe to past and future lairds; thereby educating the new mindset into valuing not only our heritage, but those who keep it alive. FOLLOWING conflicting recommendations on best views of the annular eclipse of the sun on May 31st, 2003 a lone FOG decided to go for the local scene – cloud or no: a pre-sunrise walk along the ancient track which once connected Bourtie parish with that of Meldrum, passing the earthfast Bellman stone from which the Bourtie RSC, NJ801 249, is downslope SW. The Bellman stands at 600 ft/185m, a clear horizon marker from the circle for both winter moonrise and summer sunrise, but anyone standing on the rock would see the rising orb fully 5 minutes before watchers within the circle, because of the lie of the land. Tumbled thoughts of four-minute solar eclipses jostled for position in a dawn-fog (in both brain and landscape): wondering whether it would be visible at all at such altitude, or all over before the sun came up. Wisps of floating haar added to the uncertainty. I pondered the awesome scene: pre-dawn light gave the fields rolling down to the circle an eerie pink glow, exaggerated by marvellous ‘set-aside’ all around; the valley of the Garioch including Inverurie was invisible within thick mist; only Bennachie stood above the clouds. There was utter silence: no lark sang. This was the neolithic landscape, as close as if in a time-warp. At 4:45am, just when I thought it was all over, a deep red orb glinted through haar in the saddle between the Crocker hill and the Hill of Barra ‘entrance’ to the fort. By 4:50, all haar miraculously dispersed, a red sun stood above the NE horizon with a decisive chunk bitten out at 8 o’clock: it was happening! Not only was this not a four-minute eclipse, but one which continued to happen for another hour. At 5a.m. the sun would just have been visible from the RSC below – still more than half obscured by the moon’s disc: what rituals this sight must have generated 5000 years ago – what dire consequences seen in the mind of primitive man. AGM notification will appear in our Lammas issue.